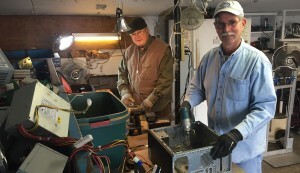 Grey Bears is the only County recycler that provides both end-of-life electronics recycling and reuse services on a significant scale. This unique dual-competency allows Grey Bears to provide secure and compliant solutions for all electronic material streams, including obsolete e-waste and fully functional IT hardware. 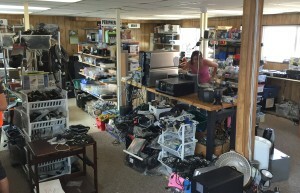 We accept electronics and appliances including computers, TVs*, monitors, printers, stereos, CD/DVD players, appliances large and small including refrigerators, freezers, washers, dryers, microwave ovens – at our Chanticleer Center with no drop fees. *Except DLP (Digital Light Processing rear projection) TVs which are considered Hazmat and subject to a $30 processing fee. If you are a public or private business with quantities of appliances and electronics and need a pick-up, email Tina Forest to schedule a pick-up, or call 831-479-1055 ext. 235. Volunteers disassemble and recycle components, or refurbish computers for sale in our Computer Electronics Store, eBay store and craigslist store. Usable hard drives are sanitized (permanent removal of data) and Microsoft Windows or Apple operating systems are installed. Please note: If dropping a TV or computer monitor, CalRecycle requires us to record your name and address (and telephone number if dropping five or more units). You’ll find great values on everything from complete computers and laptops to printers, monitors, hard drives and other components, and stereo gear and appliances at our Santa Cruz Chanticleer location. Computer Store Hours: Open every day, Mon–Sun, 10am–3pm.